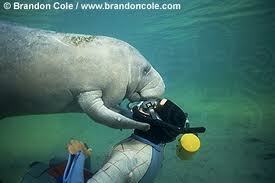 Marguerite-aville: Do you hate manatees? If not, act now! Yes, I disappointed The Broken-Legged Frog (or possibly Toad) — I lapsed on my 30-day Blog-a-thon. I think my flash of apathy came about because the Blog-a-thon—unlike a Tele-thon or Walk-a-thon or Toyota-thon—isn’t rallying around sick children, or stranded polar bears, or discounted sedans. Maybe it comes from my years in the Girl Scouts, or from working in nonprofit fundraising for so long, but I always see the potential in turning virtually any activity into an excuse to raise money. Drinking beer in my backyard on a nice day? If it’s for charity, heck, I’ll stay out there all day long! If not, I’ll … well, nevermind. Same goes for blogging. So, I’ve decided to re-start the Blog-a-thon, and this time, make it for an actual charity. Tonight, Paul and I are going to the local League of Conservation Voters “Evening for the Environment” (apparently, Daytime totally hates the environment...) with our friends Sarah and Keith, who is on their Board. Seems like a good cause, so I’ll blog to raise money for them and/or (reader's choice!) Save the Manatee, in Florida. From the video series "Manatees Gone Wild!" 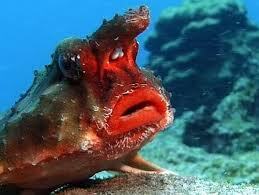 -- drunk make-out sessions w/divers. If I can be like the actors breaking the fourth wall after a Very Special Episode of “Growing Pains,” I have to say that, as someone who grew up (mostly) in Florida, I really do love manatees, and there are a lot of simple ways that we can help protect them. I remember once, years ago, being out in a boat on the St. John’s River, when a stupid phallic-shaped speedboat going at least 80 MPH hit a family of manatees that we’d watched swim past only a short while earlier. Everyone yelled waved, but the boat didn’t slow down, despite the fact that it was close enough to shore that they shouldn’t have been going that fast in the first damn place. One of the manatees died, but I’m pretty sure the boat owners didn’t suffer any consequences other than spilling the Bartles & James wine coolers they were probably swilling. Will you pledge any amount in support of this project? 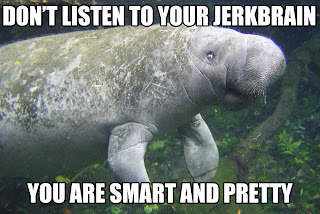 If not, I’ll have to assume you hate me (and/or Manatees, and/or the Earth). Please help me to avoid procrastination save Sea Cows (not to be confused with “Chicken of the Sea”)! Or, for all you Pacific Northwest types, your contribution to the League of Conservation Voters money may help curb environmental changes that are affecting those adorable polar bears. And possibly help less-cute wildlife, although we don’t have to pretend to care. Here’s how it works. Pledge in the Comments to give to either charity (or both! ), in any amount (you don't even have to specify, if you don't want to). I won’t collect any money--I'll just trust you to go directly to their site and throw in some coin if/when I rise to the challenge. The manatees feel confident that you can do it --and, by the way, they think your hair looks really nice today. I will donate an indeterminate sum ($100?) to an animal shelter, for the express purpose of helping phsically and mentally deficient chihuahuas. You're right, manatees are super lazy. They would rather sit around and drink beer and collect welfare than get a job at Sea World. Yay!!! So re-begins the Blog-a-Thon! Will do it for the chihuahuas--I want them to get their literacy training. Thanks, Anon, you rock!